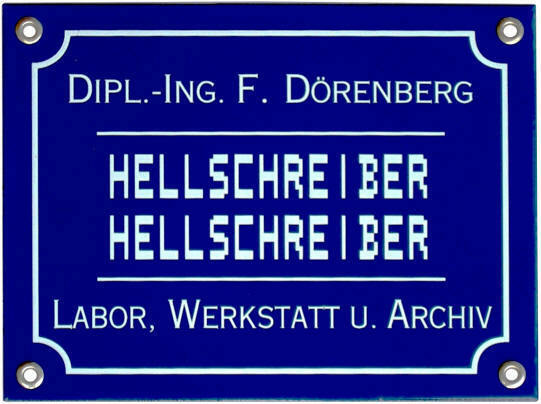 In 2008, I became the proud caretaker/operator of a 1938 Hell Feldfernschreiber teleprinter machine. I decided to create a web page for it. As you can see from the main menu above, that original page has grown into the reference website about everything that is related to "Hellschreiber". The pages of this website are updated and expanded on a regular basis, so check back here once in a while. The update notifications are listed here. You can subscribe to these notifications by clicking on the RSS-icon to the right, or here. There is always room for improvement. So, if you have any information or material you'd like to see here, comments or suggestions: don't hesitate to contact me! 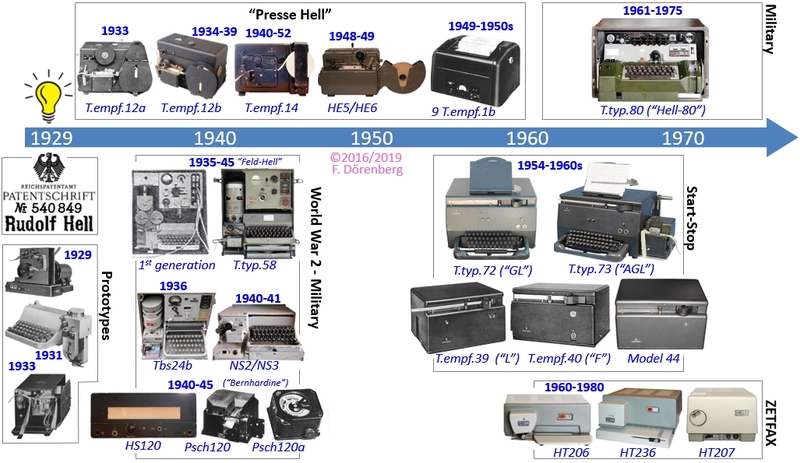 All of the above 60 or-so Hellschreiber models are described on this website - check the "Presse Hell", "Feld Hell", and "Other Models" tabs of the main menu at the top of this page! HOW I GOT HOOKED ON "HELLSCHREIBER"
As stated at the top of this page, in October of 2008 I had the incredible fortune and honor that Hans Evers (PAØCX / DJØSA, ex F2ZI), was so very generous as to entrust me with his original 1938 Siemens Hell-Feldfernschreiber. Hellschreibers are rare to begin with, but this unit is even more rare: it is complete with an original power connector and case-cover. As such, it is a "living" museum piece that I am very honored to be allowed to operate and take care of! It is in its original state and still has that typical "surplus" lubricant smell. Coincidentally, it was about 20 years (!) earlier that Hans' 1977 landmark article in Electron (of the Dutch amateur radio club VERON) got me "hooked" on Hellschreiber (the English version of this article appeared in Ham Radio a year and a half later). As engineer-at-large, I was immediately charmed by the elegant technical solution and operating principles of Rudolf Hell's teleprinter system. A year or so later, I attended a presentation about German WW2 radios by Arthur Bauer (PA0AOB) at a local amateur radio club of Delft/The Netherlands, and got a close-up look at a Feld-Hell machine. This was the revival period of Hellschreiber. I followed the subject in the amateur radio magazines (primarily in The Netherlands and Germany), and built my own little printer in 1983. 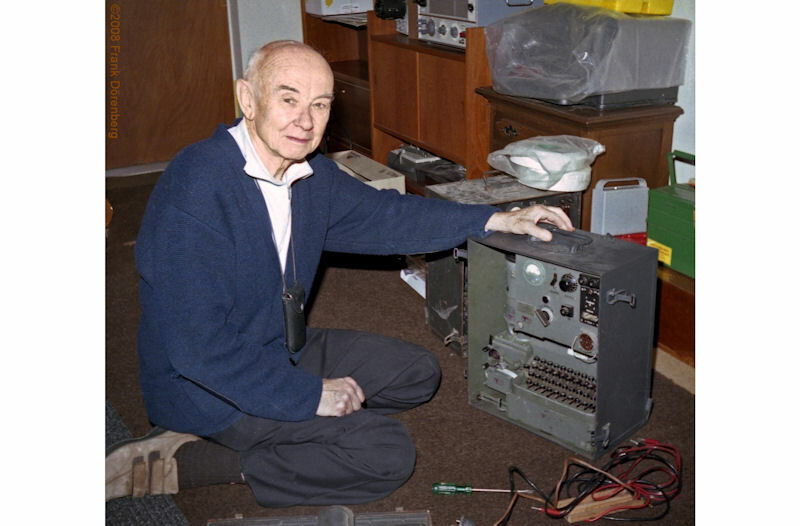 Some time after the war (WWII), Hans had heard rumors that the Dutch Red Cross had acquired a large amount of surplus communications equipment. After a number of years, the equipment had become obsolete and the Red Cross needed to dispose of them. Most of it went to radio amateurs and surplus dealers. Hans had missed out on this opportunity, but via the Red Cross office in The Hague, he managed to get the address of a barn where the "old junk items that nobody wanted" where kept. This must have been around 1960. It turned out that indeed, most of it was junk. One item did catch Hans' attention, though he did not know exactly what it was... Looked like some interesting kind of printer. So Hans took it home with him, where he powered it up with the required 12 volt. It made noise and the motor turned. A replacement ink-roller was improvised, and Hans got the printer to work: as you type, the typed text appears on the paper tape. The thing worked fine, and it was stored away. Some time later, Hans got a phone call from Arthur, PAØAOB, whom he did not know yet. Arthur had somehow found out that Hans had become the owner of a Hellschreiber. They agreed to give it a try, and scheduled a QSO on 80 meters - it was a success. 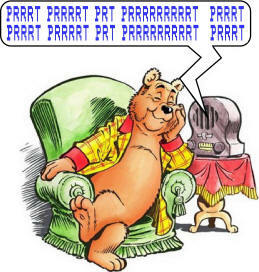 Amateur radio stations must generally identify themselves by transmitting their assigned call sign at the end of each communication and at least once every 10 minutes during communication. Depending on the country, this may be done with one or more of the following means: CW/Morse, phone, RTTY, image emission, digi-mode. The keyboard of the Feldfernschreiber does have a key for Morse-code telegraphy. However, Hans used a clever and simple home-brew gadget to transmit his (French) ident in CW. It consists of a piece copper-clad circuit board with the text "F2ZI HELL" etched in Morse code. It is connected in parallel to the keyed output of the Hellschreiber. Simply slide the probe pen across the two tracks to send the ident. This technology dates back at least to World War 1. Rather than one or more fixed messages, the pad shown below has a separate track for all letters and figures. The letter-marker (the white bar above and across the tracks) could even be slid sideways, so as to achieve simple offset-encryption. It was introduced so that German airborne artillery observers did not have to learn Morse-code. The call-sign ident pad of Hans (PAØCX/F2TI) and a 1915 Telefunken "Morsezeichengeber"
Yes: this website takes a considerable amount of my time and effort - my pleasure! Yes: owning a website costs money (annual domain registration fee, annual web hosting). Yes: providing some of the content requires me to incur cost for travel to archives, museums, libraries in several countries, copy documents, etc. No: I am not asking you to send me money! HOWEVER: if you find this website useful, please consider making a donation to your local Animal Shelter, S.P.A. (Society for the Protection of Animals), Animal Rescue Center, etc. If you do prefer to help pay for hosting this website, you can make a donation via Paypal, directly to my hosting service-provider (DreamHost) - not to me. Just click on the "Dollar" or "Euro" button below. Thank you very much in advance!